Rewarding Times has teamed up with Citywest Jewellers to offer Rewarding Times customers an opportunity to purchase the Orla Kiely Iris Watch. 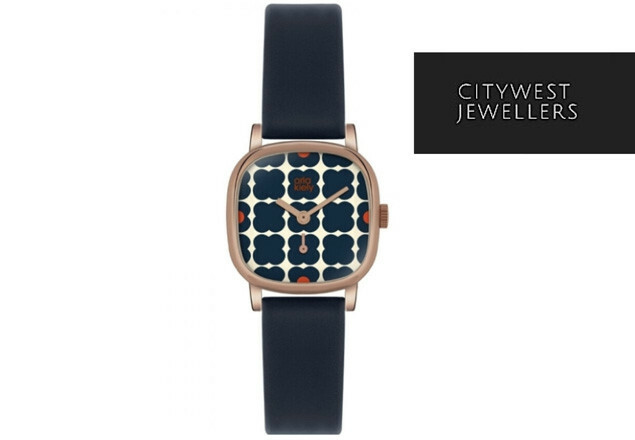 This watch is signature Orla Kiely style, navy strap with navy petal detail. It is crafted with precision for a sophisticated and elegant style. The bold flower print to the face of this ladies Orla Kiely watch combined with the smooth curves of the cushion shaped dial and navy coloured strap give retro styling. Accents of vibrant orange to the face add a splash of colour. With rose gold plated casing and hardware finishing the look, this watch also has a second’s hand to a sub-dial inside one of the flowers. Design for the timepiece is completed having a soft navy blue leather strap for added comfort. This is a superb watch with a striking design.